About the Book: When wizard Wayland North shows up in Sydelle Mirabil's town and brings with him the long missing rain, he's offered a reward-and chooses Sydelle to accompany him on his journey. A cursed wizard, a looming war, and powerful storms brewing wherever they go, Sydelle is whisked off on an adventure she had only dreamed about before meeting North. 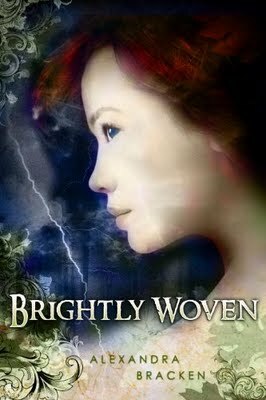 GreenBeanTeenQueen: I've never been a big fan of high fantasy, so I wasn't sure if I would really enjoy Brightly Woven. Turns out, Alexandra Bracken has what it takes to make me enjoy fantasy! The book starts off quickly, which I loved (I've mentioned before how I hate when the summary mentions part of plot that doesn't occur until halfway through the book). That's not the case here-the adventure is off and running from the start. One of the reason's I'm not typically a fan of fantasy is that I find the worlds and magic and rules somewhat difficult to follow. But the world set up in Brightly Woven wasn't overly complicated. It still took some time for me to understand everything-things are revealed throughout the novel, so you discover the world and how magic works in pieces. This is Ms. Bracken's debut novel and I thought it read like a first novel-the story could have been a little tighter in places and some of the characters developed more. But I do think Ms. Bracken is a writer to watch and I think she has a great future as a fantasy writer ahead of her. I also like the fact that the book ended in a place that I'm happy to have it end-no major cliffhanger, still room for a sequel, but I'd be ok as a reader if there's not. I would be interested to see another story set in this world, since I really enjoyed Ms. Bracken's take on how magic worked. I do have to mention that one of my teens at the library borrowed my copy and when she finished it told me that it was amazing and she loved it and she couldn't wait for a sequel. So this one should have high teen appeal and I'm sure your fantasy readers will love it. I agree with the lack of development of Sydelle and her childhood friends. That was the one thing that kind of bothered me as well. But, overall I really enjoyed the book. I'm glad you did too! I'm a huge any-type-of fantasy fan, and I've been looking forward to reading this book! Glad to know that you enjoyed it overall. That says a lot when someone who is not a big fan of a genre likes a book from that genre. Nice review! i still have 2 read this one! I've seen this around, and only saw one not so good review. I'm keeping it on my list! Great review! I enjoyed this one but you are right..EVERY reader at my library who has read it so far as totally gushed about how much they loved it! So a big YES on the teen reader appeal! Emily-I'm glad you saw that too. But overall, it's a good read! Faye-I hope you get a chance to read it! fredamans-I haven't seen very many negative reviews on this one-lots of readers really like it. I'm a huge fan of fantasy and high fantasy. Also I'm an aspiring fantasy author. I really want to read this book, even more so after your review, to hopefully do what she did right to keep someone like you who doesn't love high fantasy reading. I think your review was spot on-especially the part about the ending! I totally agree. Like you, I am not a huge fantasy fan, but I am trying to branch out of my comfort zones! I really enjoyed finding an engaging story that is totally clean. I would have no trouble giving this to a younger student who reads at an advanced level. Megan-So true! There is nothing in this book that would prevent me from giving it to younger readers!